Kathryn was born in Albuquerque New Mexico Kathryn graduated from University of Nevada, Las Vegas with a bachelors of Science in Business Administration, with a concentration in finance and another hundred-and-one hours in the liberal art; however, her first love has always been modeling, music, dance, theater and film. Kathryn got her AFTRA card as a dancer in the Don Rickles Special. Kathryn has worked in stage productions, movies, TV, voice over’s and commercials. While as a securities broker Kathryn met and married Richard L. Hisaw, who is from Las Cruces, New Mexico. Besides her SAG and AFTRA affiliations, Kathryn’s accomplishments include such honors as, Miss New Mexico, one of the KOB Golden Girls, Miss New Mexico Key America and a competition winner in the Model Association of America at the Waldorf-Astoria in New York. October 2013 launches her CD, An Evening With Kathryn. You can purchase the physical CD for total price of $15.00. The $15.00 includes all tax and mailing to you, or you can digitally download the songs or album through your favorite digital site starting November 25, 2013. An Evening With Kathryn will be carried by online retailers such as I Tunes; Amazon MP3; beatport; Spotify; Rhapsody; Stompy; etc. Just enter An Evening With Kathryn by Kathryn Rehm Hisaw. Make sure to visit me on Facebook! Thank you for your order. 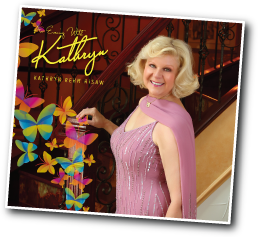 View the press release about Kathryn's new CD. Order Kathryn’s CD with a beautiful selection of popular songs beautifully arranged by leading musical artists. Order now.